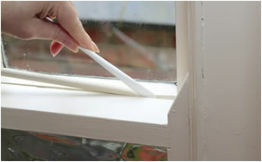 Draught proofing sash windows is a slightly trickier proposition than casement windows. The best way to do it is to remove all the beading which the windows use as runners to run up and down on and replace them with special beading which has a bristle strip embedded into them. Additionally, and this is the really tricky bit you need to have more bristle strip embedded into the windows where the top and bottom windows meet to stop drafts coming in there. This requires removing the windows and using a router to cut a channel in the wood. There are many sash window restoring businesses which will do this for you. If you want to attempt it yourself you can buy a kit which will supply all the parts you need together with an instruction manual. If the above seems a bit daunting or too much work there is an alternative. This doesn't involve removing beading. It uses a combination of compression draught strip and bristle strip. It's not so stylish a solution but will still give good draft proofing. For the lower sash fit bristle strip to both sides of the beading on the inside marked A opposite. Cut the strip to size then with the window closed nail/screw it in place. Do exactly the same for the upper sash BUT on the outside. 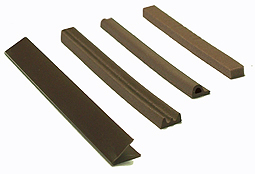 Gapseal is a spongy rubbbery seal that is designed to fill the gaps in sash windows. It is designed to fill gaps from 2-9mm. It is really easy to use. Simply cut it to length and then press it into the gaps in your sash using the applicator tool that comes with it. It expands to fill the gap. 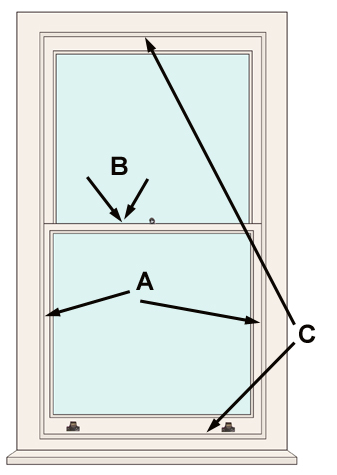 Unlike the examples above which still allow opening and shutting of the sash Gapseal should be used more where there is little desire to open the window in the cold draughty months. If you do the seal will be disturbed although it is easy to refit.